Firenze ... Ottima città! Da visitare assolutamente! Florentia Rossini is located in a good and quiet neighbourhood (San Jacopino), at the 2nd floor of a nice and very quiet condo, close to the historical center, the central train station Santa Maria Novella, the Exposition center Fortezza da Basso and the Congress Center. In the neighbourhood you'll find grocery stores, supermarkets, a bank, a chemist's, a post office, various restaurants and almost anything you need in daily life. a large living-kitchen and a bathroom with confortable shower cabin. It has just been refurbished and newly furnished. 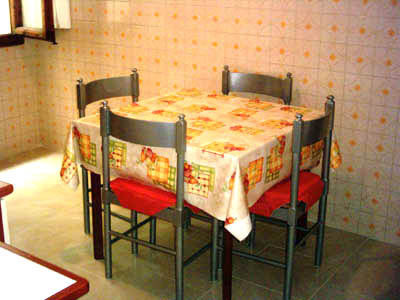 The kitchen is - just like the rest of the apartment - well furnished and pratically equipped. 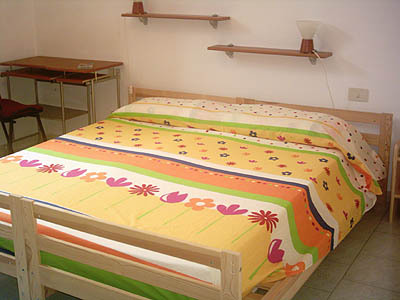 On a daily basis starting at 20 Euro per person/night (including bed sheets and towels). You can park your car on the street in front of the establishment, we are in a safe residential area. If you would like to visit museums or concerts or need assistance with your travelling schedule or train/airline tickets, we will be glad to take care of that for you. Just let us know when you make the reservation of the room, because once you get here it might be too late to make reservations for the museums. You will get a confirming email directly from us within 48 hrs after your reservation made on this site. If you don't, please get in touch with us after your reservation to make sure your reservation has reached us. If your reservation is last minute, please call us to confirm your arrival, because sometimes emails have arrived after the client got here. WE DON'T HAVE A RECEPTION AND NOBODY WILL BE HERE TO CHECK YOU IN, IF WE DON'T KNOW THE HOUR OF YOUR ARRIVAL, SO PLEASE CONFIRM THE HOUR OF YOUR ARRIVAL CALLING OR SENDING AN EXTRA EMAIL! WE DO NOT ACCEPT ARRIVALS AFTER 9 PM (21. 00) SO PLEASE DON'T ASK FOR IT AND DON'T MAKE A RESERVATION IF YOU CAN'T BE HERE BEFORE 9 PM, EVEN IF THIS SITE WILL ALLOW YOU ANY ARRIVAL TIME! RESERVATIONS WITH ARRIVALS LATER THAN 9PM WILL BE CANCELLED AUTOMATICALLY! In case of overbooking or arrival after 9 pm despite our recommendation, Florentia Rossini reserves the right to transfer clients to B&B Florentia or another equivalent accomodation (if available). One more recommendation: Florentia Rossini is in a very quiet condo of only few families, so in the name of good neighbourhood our guests have to respect that as well. If you prefer partying and loud places or are not willing to follow this condition not to disturb your neighbours, PLEASE DON'T MAKE A RESERVATION WITH US! We want our guests (and our neighbours) to be able to relax so that ALL can be happy and enjoy themselves! 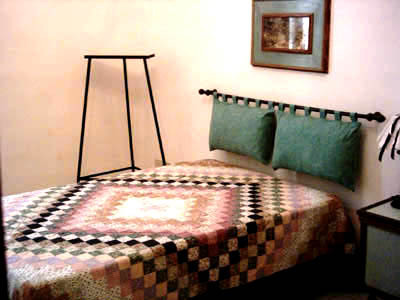 1 triple room with 1 single bed and one queen size bed, 1 quadruple room with two single beds and one queen size bed, 1 single double room with french size bed. 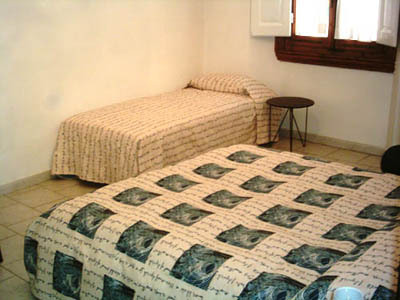 Prices (per room/nt): Double room single use: 40 Euro/Overnight stay, 45 Euro/Bed & Breakfast - Double room: 57 Euro/Overnight stay, 67 Euro/Bed & Breakfast - Triple room: 75 Euro/Overnight stay, 90 Euro/Bed & Breakfast - Quadruple room: 88 Euro/Overnight stay, 108 Euro/Bed & Breakfast - Extra bed for children 0-3 is 10 Euro/nt, children over 3 years will have their own bed (15 Euro/nt). Children have to be indicated as an adult, even if you intend to let them sleep in your bed. 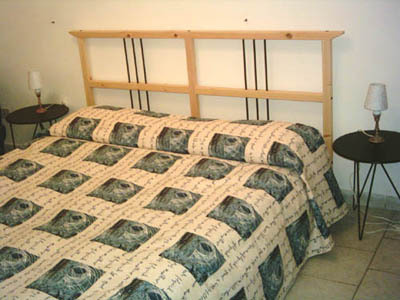 On request we will put at your disposal baby beds, from 4 years on they shall have their own bed. In case that children have not been indicated in the reservation, the before mentioned fee will be applicated in addition to the booked price and/or the room type changed to more beds (if available). If you would like to rent the whole apartment with a maximum of 9 beds and use of kitchen or just a room with use of a kitchen, then Florentia Rossini is just right for you! 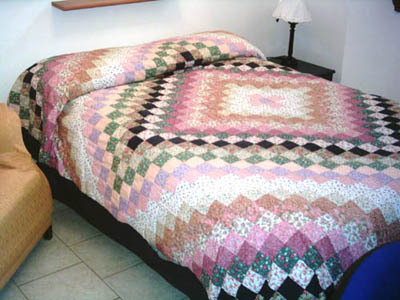 Minimum rate is for a bed in a quad room and maximum is for a quad room at holiday rates. Payment has to be made at arrival (in cash). We don't accept, cheques, traveller cheques or credit/debt cards. For cancellations 7 or less days from the date of arrival and in case of no-show 100% of the total amount of the stay is due (minimum 2 nights). After arrival at the B&B the total amount of the stay is due, changes are not accepted (prolongation of the stay are possible only if there is vacancy). Take bus no. 22 or 57 from the train station in direction to Piazza San Jacopino and get off in Piazza San Jacopino. Go back to the street the bus came from (Via Cimarosa) and turn the first street right (Via Rossini). Go until no. 11 (blue) in front of Cafè Rossini. Make sure you will arrive at Santa Maria Novella, not at the train station of Campo di Marte (it's on the opposite side of the city). From Campo di Marte you have to take 2 busses, first no. 12 to the central train station Santa Maria Novella and then no. 22 or 57 to piazza San Jacopino. Bus tickets are available at any tabacchi store or at the newspaper stands at the train station (not on the bus), make sure you stamp the ticket on the bus, otherwise you may get a fine. Take a taxi, because it is inbetween the airport and the train station (about 4 km), so if you take the shuttle to the train station, then you have to take the bus no 22 or 57 half way back to piazza Sant'Iacopino. If you would like to be picked up at the Airport Amerigo Vespucci in Florence (NOT IN PISA! ), let us know, airport pick up is only 15/person.